Detail : Paul's thirty-second single. 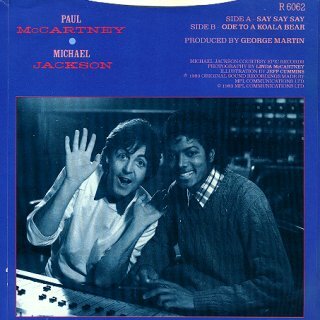 Credited to "Paul McCartney and Michael Jackson". 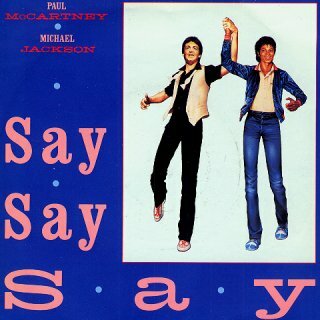 This track was actually recorded over two years earlier, in June 1981 at Paul's private studios in Scotland. Paul was recording tracks destined for both the "Tug Of War" and "Pipes Of Peace" albums and was joined there by Michael Jackson. The excellent video comprising Paul hamming it up as a travelling elixir seller, with Michael as his stooge, was recorded two years later in Los Alamos, California from October 4th to 7th. The video costs half-a-million dollars to make, and even included Heather in a brief cameo during the foster home scene. The pool sequence is filmed in the town's Union Hotel. The first showing of the video was scheduled for "Top Of The Pops", but Paul pulled the clip as he was unhappy with the soundtrack, by the time Paul IS happy with it, the single is slipping down the chart, and the program NEVER (at that time) plays fallers. Therefore it's first airing occurs on Channel 4's "The Tube" on October 28th, and it does the trick, by shooting the record up from no.14 to number 3 of that week. The 12" version is longer at 5:40, and is remixed by D.J. producer, John "Jellybean" Benitez. The same remixer also adds a 7 minute instrumental remix to the 12". The single was released in a picture sleeve (albeit with the most ridiculous sleeve drawing ever inflicted on a major recording artist), with the 12" having an identical cover. On the runout groove is, what looks like to me, a harp with "TOPIA", and with the harp looking like a "U" ... I guess it is someone's symbol for "Utopia". Incidentally, my copy of the 7" has no label at all on the B-side ... it is totally black. This single was deleted 31st October 1987.